The DC live-action universe has had a fascinating tenure in theaters, full of peaks and valleys. As such, Warner Bros. is constantly adjusting their plans, with surprise news often hitting the general public after the fact. Following the poor performance of Justice League, the DCEU is pivoting away from serialized storytelling, with movies like Aquaman and Shazam! focusing on their title character, void of crossovers. Well, that’s certainly exciting. 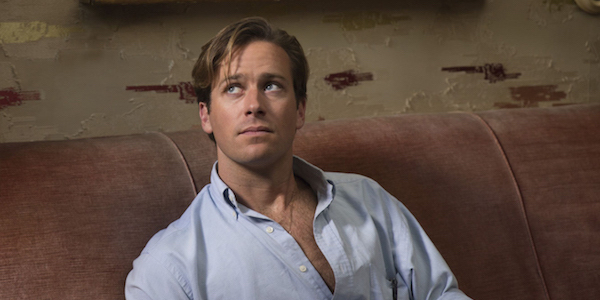 While shutting down rumors that he’s been approached to play DC’s new Bruce Wayne, Armie Hammer also revealed that he’s absolutely interested. So if he gets the call, Hammer would be down to don the iconic suit and use all of Batman’s wonderful toys. Armie Hammer’s comments to USA Today are sure to illicit plenty of reactions from comic book fans. Batman is one of the most popular superheroes ever, so there’s a ton of pressure associated with the casting of the Dark Knight. There was plenty of backlash when Ben Affleck was first announced in the role, although he ended up proving himself, bringing a jaded and experienced adaptation to the silver screen. Hammer is at the top of fan lists for possible Batman replacements, so his excitement over the potential role is going to get heads spinning. From what we’ve heard about Matt Reeves’ The Batman, the project is going to star a younger version of Batman, and focus on his detective work in Gotham City. Armie Hammer seems like a solid choice, as Ben Affleck is 14 years his senior. There would certainly be a juxtaposition between the two actors, which might be exactly what Reeves is hoping for. The latest news about The Batman also reveal that Matt Reeves is reportedly looking for a big name to play his Caped Crusader. Armie Hammer’s star power has been steadily growing over the past few years, so he might be the tier of fame that Reeves is hoping for. He got action experience in The Man from U.N.C.L.E., starred in Oscar bait Call Me By Your Name, and even voiced a superhero in Stan Lee’s Mighty 7. So it might be the perfect time for Hammer to step into a full on superhero role of his own in live-action. Armie Hammer has a history with Batman, as he was cast as the role in George Miller’s failed Justice League Mortal movie. He’s ultimately glad his role didn’t come to fruition, but I guess he’s still got his eye on the cowl. Armie Hammer’s Hotel Mumbai opens in theaters this weekend. Be sure to check out our 2019 release list to plan your next trip to the movies.